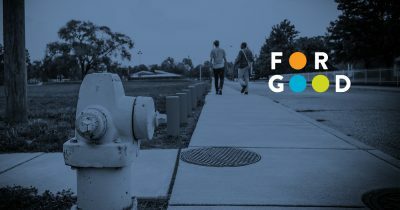 In this special episode of For Good, Alicia Collins talks about criminal justice reform—one of five of CICF’s leadership initiatives for Marion County—and how it is impacting our community. This episode is part of a special series introducing CICF’s strategic plan for Marion County. Listen to the other four episodes to learn more about how CICF is working to help create a more equitable Central Indiana. You’re listening to For Good, Central Indiana Community Foundation’s podcast highlighting stories about passion, purpose, and progress in Central Indiana. At CICF, we believe in creating a community where everyone can reach their full potential, no matter place, race, or identity. In this episode, you’ll learn about one of the initiatives included in CICF’s five year strategic plan for Marion County from experts on our staff. ALICIA: Hi, I’m Alicia Collins, director of community leadership at the Central Indiana Community Foundation. CICF has a mission to mobilize people, ideas, and investment to make this a community where everyone has equitable opportunity to reach their full potential no matter their place, race, or identity. And we have five initiatives that will help us execute this mission in Marion County. One initiative is criminal justice reform. Criminal justice reform for the foundation has led beyond our work in crime prevention to look at not just safe communities but really addressing the issues around criminal justice for better outcomes for everyone interacting with the criminal justice system. CICF has been a part of crime prevention at least five years with the city and with the new strategic vision. We want to go beyond that to look at filling in the gaps around criminal justice reform. And we feel that those areas are connecting individuals who are coming out of the jail to resources as well as looking at the prevention part around the school to prison pipeline in looking at prevention work as well. So it’s a continuum from prevention all the way through reentry. Why the foundation is focusing on criminal justice reform is based on the data. The Star article in December of 2018 highlighted the statistics of the crime that’s happening in Indianapolis and Marion County, and highlighted how place matters and also race. The comprehensive report looked at homicides going up for the last four years. Also, victims and perpetrators of homicide overwhelmingly were males, black and younger than 35 years of age. And connecting that to the criminal justice system, 70% of males in the prison system do not have a high school diploma. So we feel those issues are really impacting our community. CICF is investing in a comprehensive strategy through crime prevention and looking at all the things, root causes around crime. And so we’re looking at not just housing but basic needs in terms of juvenile justice issues, mentoring and getting young people to stay in school or get them connected to a pathway around a career or to enlist, as well as mental health services. So those are some of the things we’re currently investing in and as we look beyond into the new strategic plan, we’re looking to reduce those kids from being kicked out of systems like the school system that leads to maybe the criminal justice system. So keeping those kids in school, so looking at the culture around what’s causing a lack of positive school discipline within that school system. So some of the barriers that exist for the population that are impacted by crime are access, lack of access to employment, lack of access to housing. Those are critical, those are seen as basic needs, especially, housing. If you don’t have one housing, then your opportunities to gain additional services is less. Looking at those who are coming out of jail we know that there are no, there’s a lack of navigation for those individuals to connect to resources. So, wanting to invest in creating some kind of navigation system for individuals to connect right out of the jail system into resources, into housing, into those basic needs. We know that life is, is crucial and so we know that homicides and violence creates, you know, a lesser quality of life for individuals. And so we want to ensure that everyone has equal opportunity to thrive. And so this is a, a foundational piece of our work around creating safe communities. If we don’t do anything around violence reduction, crime will increase, violence will increase and quality of life will decrease. What excites me about our investment with criminal justice reform is really seeing the continuum of our work throughout the whole entire system. So not just focusing on reentry and crime prevention, but also looking at prevention early within the education system and really bringing that within our continuum of our work.